Brad Kalbeld has seen it all. From carrying a heavy typewriter around and a Telex machine, he now is able to hold a small tape recorder and — even better — can whip out his iPhone 4 to do the job for him. Event, reporter, copy editor, section editor, managing editor, reader. But with the way that technology has constantly been improving, the role of the editors has been nearly erased. Rather than waiting for and hoping that the editors will publish what you’ve written, reporters can take a video of anything interesting that they see and post it to their computers and the internet for the readers to view. Professional journalists are scared of citizen journalists. We are now living in a one-click world and citizen journalists are now able to snap pictures, take videos, take audio of anything going on even quicker than a typical journalist could at times. This ability could steal viewers from the professional journalist and attract them to that citizen journalist’s publication. You must have news that interacts with the audience nowadays. Traditional journalists would find a story, report the news and that was it. Now, they must worry about getting the viewers involved and interacting with them to keep them engaged. This transition can be difficult for some. In today’s class, we heard from Brad Kalbfeld, who among other things, is the editor of the “Associated Press Broadcast News Handbook.” Kalbfeld brought us on a journey across the decades, showcasing his early reporting equipment (namely, a typewriter) and leading into how the advent of the iPhone has become a universal journalism tool. Through the use of flowcharts that display the differences between the modern era of news versus the way it was in the past, Kalbfeld argued that nowadays, the audience has more power than ever in dictating what news they read and watch. There used to be a limited amount of choices–three channels, two newspapers in most markets–but now the audience is overwhelmed with options. Of course, there are pros and cons to that. There is less of a duty to be balanced because there are niche (and mainstream) publications that appeal to every sort of political/religious/ethnic population. Amateur journalists also don’t have the same skills or background that should, in theory, lead to quality and ethical reporting. Kalbfeld suggests readers look at the “About Us” page to learn about the attitudes and biases of particular journalists. News is now a brand, and some viewers consume it based on factors that other than what would best serve them (the attractive anchor, the political attitude, even the style or format of the page). News is at its best when it interacts with the audience, rather than being a one-way street as it used to be: ignoring the audience is a good way to see it flock to somewhere else. I thought Kalbfeld was an especially interesting guest because he’s been around in journalism for so long and has first-hand experience in vastly different circumstances of news filtering. It was a really excellent presentation. Brad Kalbfeld, former AP broadcast editor and foreign correspondent, started his presentation showing us a little bit of the things he used to report. He showed us his first laptop, his old typewriter, and his tape recorder. They all look really heavy and outdated. Today, we don’t use single-purpose devices. We need multipurpose devices, like an iPhone. Citizen journalists: they have their eyes on you. Then he talked about all the filter news would go through before reaching the public. Now everyone that has a iPhone makes an editorial decision — to report the event or not– and they can be the first and only filter. We cannot ignore what the reader/viewer want. They are empowered by the information that is available. Reader/viewer is in charge. The newsrooms were composed by people of the same background, and it didn’t consider the needs of the diverse audience. It reflected their point of view. Now we can use our remote control. We can change the channel and click the mouse whenever we want. There are several channels. We can pick and choose. Citizen report: they can be everywhere, and cover things one journalist wouldn’t be able to do so. But are they good enough? You don’t know who they are. A secret? Traditional journalists are scared of citizen journalists. Work on your brand name. Build your credibility. People are lazy, there will go back to the same brand. Investigative journalism: you will get attention, because citizen journalists won’t do it. Brad Kalbfeld, former AP broadcast editor, visited class to speak about how technology has changed from the past to the present. He showed the typewriter he used and old school tape recorder he first used when he traveled with the Pope. 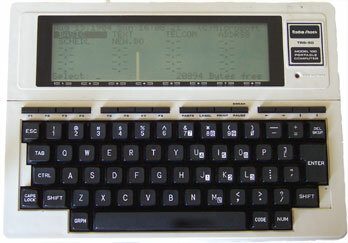 He then showed the first laptop he used, which looked like a keyboard and calculator screen combined. In the past 30 years, we have gone from using heavy, analog devices such as those typewriters and tape recorders to using the smartphones and laptops we use today. And it allows fewer people to do more jobs. The model of having a reporter, copy editor, section editor/show producer and managing editor working together to produce content for readers/viewers being threatened by a citizen with technology is unfiltered and scary. Now, there is a race to get citizens to send the information to the copy editor, to filter it. Readers/viewers are now empowered because they know what they are getting and missing from the filters in between the reporters and the editors. A citizen journalist presents a tremendous advantage to our ability to consume news: they are present. If you have a strong, credible brand, people will go to you more often, in part because people are lazy. News used to be a one-way proposition; today, news has to interact with the consumer. On Tuesday, April 5, 2011, Brad Kalbfeld stopped by George Mason University to talk to Online Journalism students. Kalbfeld is a digital pioneer. You can check out his website, Interactivity, LLC. including 22 as Managing Editor/Broadcast for The Associated Press. Kalbfeld was responsible for AP’s broadcast wire, audio and domestic video operations and has produced coverage of such major events as 9/11, the wars in Afghanistan, Iraq and the Persian Gulf, two space shuttle disasters and five presidential elections. He started out the lecture by showing off his laptop in the 1980′s. 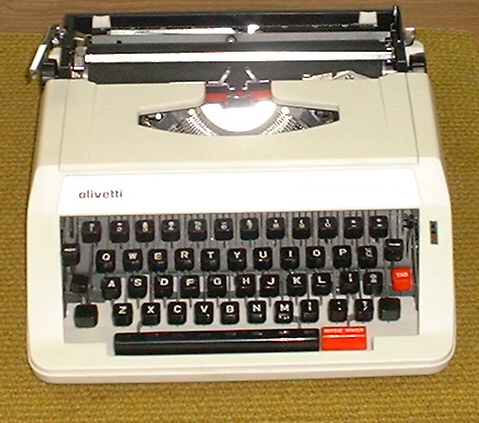 It was a typewriter. He then went on to show us his electronic laptop he got in the early 1990′s. Kalbfeld’s description of the event. who is the source of a story (ie: Reporter or “Joe Six-Pack”) and how the information trickles down the . Investigative journalism has changed in the past 36 years. “There is less money involved on the local level for investigative journalism. However, it is a great way to get attention. And if you do that enough, it’s a great business plan to make money. It is one of the chief ways investigative journalists can make enough money to make a living,” said Kalbfeld. He wrapped up the lecture by saying, “The world is your new editor”. Brad Kalbfeld, AP journalist and author of the Associated Press Broadcast Style Book, joined our class today to talk about the historical aspects of journalism and how it has changed/evolved in today’s world. Check out his Bio here. Kalbfeld showed us what a laptop and cassette player looked like from the 1980s — very bulky compared to today’s MacBook Pro standards. His next laptop upgrade was only able to show 4 lines of text at a time on a tiny screen. Using analog, expensive and slow technology with a very limited number of people having access to it is a thing of the past. Now, there are a variety of multi-purpose gadgets that have made an incredible leap in technology from the past to the present. Things like the iPhone have made it possible for anyone to have access to telecommunications. With this increase in technology, Kalbfeld notes that many of the traditional “filters” are beginning to decrease — nowadays, an article can be uploaded directly to a reader without having to pass through a variety of editors. There is often so much information floating out there that the reader/viewer is in charge. The implications of this is that the content can change, and the reader can now choose the news they want to read rather than having the news coming to them. Kalbfeld says that in the journalism world, it used to be that people from a relatively uniform background made the calls. Now, the newsroom is more diverse than ever, representing a variety of different points of view. When asked about citizen journalism, Kalbfeld noted that there is good and bad that comes with it. Citizen journalists can provide a level of coverage that professional journalists sometimes cannot. Some traditional journalists are scared of citizen journalists, because of their ability to appeal to the public. Kalbfeld believes that journalists need to find the balance for weighing editorial standards the same for both professional and citizen journalists. However, often citizen journalists do not understand how the camera can lie and manipulate stories, in addition to incorporating unwanted bias. For better understanding news sources, Kalbfeld reccommends reading the “About Us” section on news websites. As a consumer, judging for yourself where the information comes from is very important. News used to be a one-way field. Now, there are so many opportunities to interact with the audience. With the addition of the Internet, journalism has become increasingly participatory. Kalbfeld says that in the end, journalists must be aware of ethical issues. This is critical for any good journalist! He gave the history of journalism and reporting and his take on the future. Today: info moves faster, small items go a long way. Ex- the smart phone. Today, anyone can have access to information. -Reporters now are using less filters, or even directly communicating with the consumers. The editors begin to lose more power. This gives the reader more power. Why?- Reporters and Joe six-packs have to worry about user consumption. You have to be interesting. Readers have more options and outlets. The news world has changed. Reporters are now appealing to different diverse niches. So readers can decide who they want to follow. Citizen journalists can have info pro journalists can’t get. They don’t have the background to understand getting all sides of a story. In summation: Reporting in the past moved more slowly and went through filters. The cause of this was a limited variety in reporting styles and views and the appeal to a small variety or niches. Today news travels faster, and anyone can be the reporter. This gives the readers more options, which ultimately means more reporters appeal to more niches. Either way reporting must be ethical, or consumers must be aware enough to understand the difference between ethical and unethical news telling. Any old-school journalist will tell you that in order to successfully cover a multi-platform story, the key is in having the right equipment. While this used to mean having a full camera and tripod setup, a mic kit, and the right editing software, times certainly are a-changing. However, as with any new trend, there are some downfalls. While accessibility is increased, quality of audio and video has certainly decreased. With the advent of mobile journalism and the citizen journalist, some might argue that these new methods allow increased accuracy and in-the-moment style reporting. Having worked across the media industry for the past 36 years, one could say that Brad Kalbfeld has seen it all. From the pre-computer era to Twitter-topia, the media and journalism industry has transformed in these recent decaded into a whole different animal – and in order to prevent being left behind, today’s reporters must learn to live and love all forms of new media. “When people used to ask where I was from, I used to say ‘the future,’” he jokes. But all kidding aside, Kalbfeld really has been tuned into digital revolution – and it’s only benefitted his career. Not only was it his idea to integrate audio and video into the Associated Press publications, but he came up with it five years before it saw fruition. But in reality, it is those innovative ideas that create new media and what we experience today. The question now remains – what’s next?